We were fortunate to have been contacted by a great-grandson of Joseph Hamilton. Gary Lundquist is the grandson of Pearl Hamilton, Joseph’s youngest child. He would like to know if there are other descendants of the Hamilton family that he could get in touch with. Please contact us! If there is one person who can be said to be the founder and guiding light in the formation of St. Louis Park, it is Joseph Hamilton. His leadership in the nascent community can be seen in just about every way imaginable, as described below. Like many of our area’s pioneers, Joseph Kellog Hamilton was a native of Maine, born in the town of Dexter in July 1836. On May 20, 1855, he took a claim (Sections 16 and 17) and farmed 160 acres on land just north of present-day Highway 7, south of the High School, and either side of Lake Street. The 1870 census shows that he had cleared and improved 110 acres. 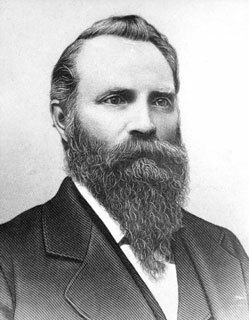 He took farming seriously, and was elected Secretary of the area Grange when it was formed in 1879. At one point he built a red brick house on the northwest corner of Dakota and Lake Streets. It was torn down in the early 1930s after laying vacant for years. You can see the home in the background of the picture below, behind the gas pumps at Christy’s corner. Kids in the photo are Janet Christy and Don Swenson. An 1881 directory indicates that he owned 120 acres. In 1886 Hamilton established the Village’s first General Store, about a mile from his farm. Although his prices were higher than those at the Great Northern Market downtown, Hamilton delivered groceries to homes and provided weekly credit. Hamilton was one of the instigators behind the incorporation of the Village. He was elected President of the Village Council (Mayor) on December 6, 1886 and took office on December 10. He held that position until 1894, and again in 1895-97 and 1899-1900. From 1888 to 1895 he served as the Village’s Superintendent of Schools. From October 26, 1889, to April 4, 1891, he served as the Village’s Postmaster. This included the period when the name of the Post Office was changed – at the Village’s request – from Elmwood to St. Louis Park. In 1890 Hamilton sold his land to T.B. Walker and the store to James T. Davis and a Mr. Williams and became a builder. Monitor Drill contracted with him to build 16-18 large two-story homes which became known as Monitor Houses. A few of these homes still exist today. He also built houses on his own, somewhat larger than the Monitor Houses but with the same basic layout. In 1892 he built the brick, two-story Hamilton Building on Broadway [6509 Walker Street]. In 1893 Hamilton donated the land for a new Union Congregational Church. For three years he also conducted prayer meetings and Sunday School for the people of Hopkins before they formed their own church. In 1896 he built his own large Victorian house, named “Sunnyside,” at 5900 Goodrich Ave. – the finest street in the Park. The house has been restored and is one of St. Louis Park’s most prized homes. Joseph Hamilton was a member of many civic and fraternal organizations, the Good Templars and the Patriotic Order Sons of America. Joseph Hamilton, one of the old residents of Hennepin county, and a prominent man in the early history of Minneapolis, died at his home at St. Louis Park Sunday, after a short illness. Death resulted from an attack of bilious fever, and came as a shock to his friends and relatives, who had not anticipated any such result. Mr. Hamilton was an active man during his business career, and was quite well known in real estate circles, where he made many friends. He came to Minnesota during the early days, and was closely identified with the early history of the county. He was a leading and enthusiastic member of the Knights of Pythias, under whose auspices the funeral was held Tuesday from the residence at St. Louis park. The interment was at Lakewood. A brief in the Tribune of November 6, 1901, indicated that his estate comprised personal property valued at about $9,000 and real property estimated at $25,000. Sarah Frances Hamilton died on November 17, 1930. Lincoln, who shows up in the Census as being born in 1855. He does not show up again and he may not be a son but another relative of the Hamiltons. Chesley Lincoln Hamilton, born November 24, 1859 – perhaps the first white child born in the area that would become SLP. Chesley’s marriage to Rebecca Hunter (1859-1940) on October 17, 1888, in Union Church was said to be the first in the incorporated Village. Their children were Martha (born 1889), Clifford (born 1891), and Ada (born 1893). Before 1933, when the Park’s street names were changed, West 35th Street was known as Chesley Ave. Chesley served as Sheriff of Hennepin County and died suddenly on October 4, 1913. Charles Herbert Hamilton (born September 5, 1873). Charles married Sadie Adella “Della” Miller on June 11, 1902. Della was born in 1878 and had come to St. Louis Park in 1892 from Horicon, Wisconsin (with Monitor Drill) at age 13. She attended Lincoln School, then Minneapolis Central High School. At first they lived in an apartment above his store in the Hamilton Building. They moved to 6207 Goodrich (built in 1908) in 1912 [his obituary says 6211 but addresses were fluid]. At about the same time, Charles bought out the Trenkley Grocery Store, located in the Hamilton Building, expanded it, and ran a general store. He was a charter member of the Odd Fellows, Rebekah Park Lodge 110, Paul Revere Lodge 321, and the St. Louis Park Volunteer Fire Department. Charles died on September 24, 1938, at age 65. Della and her sister, Mrs. George Gibson, moved to 1420 East Lake Street in Hopkins in February 1955. Ralph J. Hamilton was born on May 2, 1905, and went into the auto repair business in Minneapolis. Willard Charles Hamilton was born on June 17, 1911, and he worked in his father’s store. He graduated from Park High in 1929 and attended the U of M School of Architecture, returning to the store in 1932 and running it until it closed on November 1, 1942. After his service in World War II, he worked for Blumetal Architects as a designer. He and his wife had a daughter, Pamela Sutherland. Pamela’s daughters are Jennifer and Katharine. Willard died on June 8, 1986. Eliza died on January 6, 1878. Alice M. Hamilton – (1885-1946). In 1938 Alice was unmarried and living in Faribault. She died on May 17, 1946. Horace Leonard Hamilton, born on October 26, 1886, was said to the first child born after Park became a Village and the first graduate of St. Louis Park High School. On April 1, 1905, the Minneapolis Journal reported that Horace’s “foot was cut off my a switch engine” the week before. He was at St. Barnabas hospital “and is improving as rapidly as possible.” The loss of his foot was reflected on his World War I draft registration card. He became a pharmacist – in 1930 he was the proprietor of Hamilton Pharmacy, located at 4159 Thomas Ave. No. in Minneapolis. He may have lost it in the Depression – by 1942 he worked at the H.B. Anderson Drug Store at 2401 Nicollet Ave.
Florence was born in 1912 or 1913. No further information is known about her. Leonard Joseph Hamilton was born on October 21, 1916. In the 1940 Census Leonard was listed as a prisoner at a Marine base in Vallejo, California. He died on November 1, 1957, in Los Angeles. This story is confusing – the 1930 Census shows Lottie Hamilton living in Minneapolis with husband Tom Anderson and her children Florence and Leonard Hamilton, who were listed as Tom’s stepchildren. Lottie and Tom worked at a dry cleaner; he as a tailor, she as a seamstress. In 1930 Horace was living with his wife Lyssa, who immigrated from Canada in 1899. However, the family lore is that when Horace and Lottie moved from their home to the Masonic Home, belongings were given to friends and neighbors since their children predeceased them. Horace died on August 31, 1969. Pearl I. (born June 13, 1888). Pearl married L. Richard Lundquist. 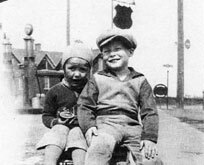 In 1938 they lived in Rochester, Minnesota. Their children were Louis Harold “Hal” Lundquist (10/29/1914- 04/20/2003) and Lucile Hayes. Hal’s children are Gary R. Lundquist and Vicki Ann Lundquist. Lucile’s children are Michael Hayes, Janis Murdock and Patricia Holtan. Pearl died on July 3, 1969.